In the Soeharto era, the educational curriculum was decided at the national level. Very little local variation was permitted. Since the implementation of a policy of regional autonomy, individual schools have much greater freedom to establish their own curriculum. As a result, the school was able to use this unique local language in the classroom. Bengkala is a small village in North Bali. For more than a century, around 2% of the babies here have been born profoundly deaf. In 2008, out of a total population of 2450, there were 46 profoundly deaf people, known in the village as kolok. People who can hear are known as inget. Almost everyone here, both kolok and inget, can speak a sign language known as Kata Kolok, or Deaf Talk. Kata Kolok is a rich and developed language. Like all developed sign languages, it uses visually transmitted sign patterns to convey meaning. These sign patterns usually involve a combination of hand signals; movements of the hands, arms, or body; and facial expressions. Kata Kolok is not dependent on or derived from Balinese, the spoken language of the village, or any other spoken language. It is only slightly influenced by Indonesian Sign Language. It is a distinct, unique language that has a complex grammar of its own. 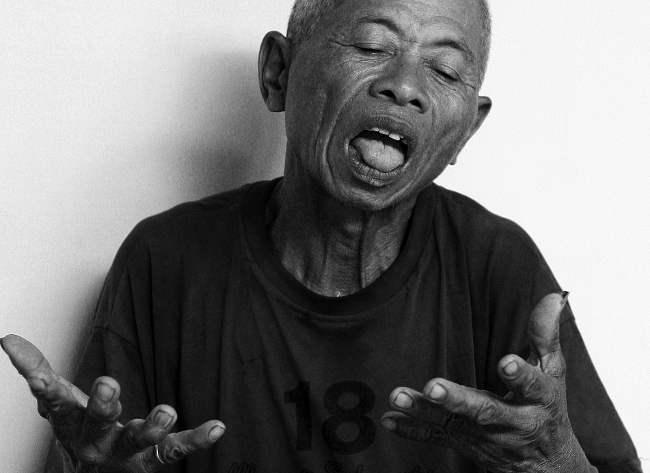 Kata Kolok is as expressive and complex as spoken Balinese. It can be used to discuss any topic that anyone in the village would discuss, from the simple and concrete to the highly abstract. Kolok and inget can engage in lucid, lengthy, complicated discussions on subjects such as agricultural production, market transactions, family life, religious ceremonies, and village affairs. In discussions involving mixed groups of kolok and inget, the deaf are at virtually no social or communicational disadvantage. The kolok often take the lead in story-telling and joking. At the primary school where Ketut Kanta teaches, Kata Kolok is now used as a medium for instruction. Since 1997, the government has classified it as an “inclusive school,” which means that it serves children of differing abilities, including both the deaf and hearing children. When the Indonesian education department suggested that the school accept deaf children from the village, Ketut Kanta and Connie de Vos, a Dutch researcher completing her Ph.D. in linguistics at the Max Planck Institute, lobbied for the use of Kata Kolok as a medium of instruction. Ketut Kanta said, “First, the children of the village are already fluent in Kata Kolok. That makes it a more effective tool for communication. Second, using Kata Kolok at school will help to preserve the language in the village and keep it alive.” Elsewhere, Signed Indonesian is used to teach deaf children, and the Directorate General for Special Education has developed a range of teaching materials that use this language. While the Directorate General insisted that deaf children in Bengkala be taught Signed Indonesian as well, they were also supportive of the idea of using Kata Kolok. In 1994, the Indonesian Department of Health estimated that there were up to 600,000 children in Indonesia who were either deaf or significantly hearing-impaired. At the time, there was no broadly accepted Indonesian sign language. With the high cost and lack of awareness of tools such as hearing aids and cochlear implants, as few as 10% of these children attended school. 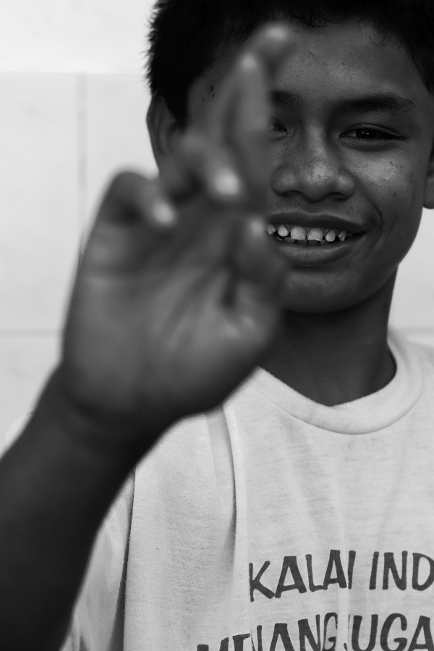 In 1994, in order to facilitate educational opportunities for these children, the Indonesian Department of Education began to develop a standardized sign language that could be used to express Indonesian. Unlike Kata Kolok, Signed Indonesian, or Sistem Isyarat Bahasa Indonesia (SIBI), is a manually coded language, created to serve as a word-for-word representation of the spoken language. Each sign represents an Indonesian word, with phrases expressed in the same word order as spoken or written Indonesian. It was created from an amalgam of American Sign Language, existing Indonesian sign languages, and newly created signs. SIBI is used to teach deaf children at Special Schools (Sekolah Luar Biasa), where all students are deaf or significantly hearing-impaired, or Inclusive Schools (Sekolah Inklusi), where most students have unimpaired hearing, but where there are special facilities for teaching the deaf. The Department of Education has developed a comprehensive Indonesian Language Sign Dictionary using the vocabulary of the Indonesian language syllabus for elementary schools. The Indonesian Movement for Deaf People’s Welfare (Gerkatin), an umbrella organization that claims 1.8 million members throughout the country, has lobbied to achieve a greater awareness and understanding of Signed Indonesian among deaf people, their families, educators, and the general public. They successfully lobbied for the integration of an interpreter to sign the news simultaneously with the news broadcast on TVRI, the national television station. As a result, the general public has become much more aware of the existence of SIBI. Everyone in Bengkala speaks Kata Kolok, except for a few newcomers. People who come from outside the village sometimes learn a bit if they deal with the kolok a lot, but they don’t speak it as well as the people who are born here. Some of the schoolteachers who come from outside the village use it a bit, because they deal with kolok children. People who deal with the kolok usually pick up some of it. But some of the inget use Kata Kolok just as well as the kolok themselves, particularly if someone in their immediate family is a kolok. There are kolok in every single clan in the village, so everyone is related to at least one deaf person. A kolok child could be born in any family, even if both his or her parents are inget. A lot of times, a kolok man gets married to a kolok woman, but not always. There are lots of kolok who get married to inget, too. If both the parents are deaf, the children are nearly always deaf, too. My wife was kolok. We had five children, and they were all deaf. My wife is dead now and so are two of my children. I’ve still got three children left. They are all grown up and married now, but they still live in Bengkala. One of my boys died in a motorbike accident. He really wanted a motorbike, so I sold some of the land I inherited from my father. I was the only boy in the family, so I inherited the entire holding. If there’s a family with both hearing and deaf boys, though, they both inherit an equal share of the land. There’s no legal difference between kolok and inget. I didn’t really want to sell my land. I told my son, if I sell our land to buy you a bike, what about tomorrow? What is the family going to eat? But my boy thought he’d get a better job if he had a bike. Then he went and got drunk and had a crash and killed himself. I used to own thirty are of land. I sold half of it to buy my boy his bike and to fix up our house. Then when my boy killed himself, I had to sell even more land to pay for his cremation and the ceremonies. I’ve got five are left. I grow bananas on it and someone grazes his cow on my land. I feed the cow and look after it for him. When the cow bears calves, we take turns: he keeps the first one, I get the second one. But I can’t survive just by farming my own land. I work as a laborer as well. I do all sorts of work. I get paid exactly the same as an inget doing the same kind of work. Everyone around here knows I work hard and I’m reliable. For most jobs, I get paid Rp 25,000 per day. I also look after the village’s water system. I get paid a bit more for that, Rp 30,000 per day. It’s a very important position: the whole village depends on the piped water. I’m proud of the job I do. The whole village depends on me. The water is piped in from a spring about twelve kilometers away. If the water stops flowing, I track down the problem. It’s hard work. The pipes run through all sorts of rough ground. Sometimes they are buried a meter under the sand. Sometimes monkeys break open pipes to get at the water. Sometimes people in neighboring villages do that too. I understand that they need water: I just tell them that if they break the pipe open, they have to seal it up again afterwards. Most of the time they understand. I avoid confrontations. Even if they don’t listen, I never hit anyone or go looking for trouble. I try to avoid violence. But people in the area know that you can’t mess with a kolok. When I was younger, I was well known as martial artist. Everyone was a bit scared of me. People treated me with respect. At temple festivals and other events, I often served as a pecalang (religious security guard). When the guys get drunk, they can get a bit out of hand. But I always tried to talk to them gently to get them to behave. I didn’t usually have to hit anyone. It’s not a good thing to hit people. Still, sometimes you have to be firm. I remember once at a cockfight, the guy who lost was drunk and wouldn’t pay up. I had to follow him and pressure him into paying. The guy who had the money coming to him gave me Rp 50,000 to thank me for making the other guy pay up. When I was much younger, I used to go around Bali performing martial arts in public for money. I could insert long nails right down my nostrils and pull them out again without hurting myself. People in the crowds gave me money. They didn’t give much, just loose change, but I went all over the island. Sometimes I met other deaf people in other places around Bali. I can’t communicate very well with them: they don’t use Kata Kolok, they use some other type of sign language. Usually, no one else can use it except them and their families, so they can’t talk to anyone else. It’s different from Bengkala. In Bengkala, kolok are just the same as inget. Well, there are a few differences. It’s part of the village law that the deaf don’t have to pay contributions for festivals and temple ceremonies. It’s always been like that. Some of the inget are no better off than the kolok, but it’s part of the village tradition that we don’t pay contributions. We still take part in all the religious ceremonies. We have the same rights as the inget. When the offerings are divided up, each head of a household gets a share: it’s the same whether he’s kolok or inget. The kolok often help clean up or with preparing the food and everything else. We contribute that way. I don’t usually go to village meetings unless they have something to do with the water system. But when I do go, no one translates what’s being said into Kata Kolok, unless somebody wants to tell me something or ask about the pipes. Usually, after the meeting is over, I ask someone what it was all about, and they tell me. I can’t really participate myself. But I think everyone at the meeting is fair, so I don’t mind. I think the village authorities look after the kolok. If we ask, they always tell us afterwards what decisions were made at the meetings. Kolok can go to the village school now. When I was young, there was no way a kolok could have gone to school! I never even thought about it. No one did back then. I taught myself how to write my name, but I never went to school. One or two people from the village went to the school for deaf people in Singaraja, but they don’t use Kata Kolok there, they use some other system. You can’t talk to anyone in the village with that system. I think it’s much better if deaf children go to school in Bengkala. Here, the kids still learn Kata Kolok, so they can talk to everyone here. Most families can’t afford to send a kid to Singaraja. Even if the government pays for them, it means they can’t work in the fields after school. And when they come back, they use a different sign system. No one in the village is going to bother learning a different sign system. Everyone here speaks Kata Kolok, not that system they teach in the schools in Singaraja. I have a sign-language name, a Kata Kolok name. I’ve spoken Kata Kolok since I was a child. I just started learning Indonesian Sign at primary school. I’m sixteen years old. I’m in the third grade in primary school. I’m quite old to still be in primary school. When I was younger, the local primary school wasn’t an Inclusive School. It only became an Inclusive School in 2007. That means that the deaf children in Bengkala can study there now. Before that, if kolok children wanted to go to school, they had to go to Singaraja, to the Special School for the Deaf. I always wanted to go to school, but I couldn’t afford to go. My parents don’t have any money. It’s a long way to Singaraja. It takes more that an hour by public transport. It costs Rp 18,000 to get there and back. It’s very expensive to live there, too. A boarding house in Singaraja costs at least Rp 100,000 a month. When I was younger, you still had to pay school fees for primary school and junior secondary schools. You don’t have to pay fees now. The regional government provides the books you need free of charge, too. You have to pay for your own uniform. Before I went to school, I learned how to read and write with Pak Ketut Kanta. He used to invite kolok children to his house for reading classes twice or three times a week. My house is quite far from his house. He often used to come and pick me up on his motorbike. I leave for school at six in the morning. I study until one in the afternoon. After that, I often work cutting timber. The timber is used to make door frames and window frames for buildings. When I don’t go to school, I often work the whole day. If I work a whole day, I get paid Rp 25,000, and I get a plate of rice and tea. I give the money to my mother. She’s kolok, too. I speak in Kata Kolok with her. She can’t spell her name in Indonesian. She never went to school. Her first husband was a hearing person. He died when he fell out of a coconut tree. My older brother can hear. My father was my mother’s second husband. He was kolok, too. At school, kolok and inget children are in the same classes. At first, we had separate classes, but kolok and inget children wanted to have classes together. Inget children like learning Kata Kolok. They think it’s good fun. Not all the teachers speak Kata Kolok well. Only Pak Ketut Kanta speaks it really well. The math teacher isn’t bad at it. He knows enough to be able to show us how to do sums in Kata Kolok. The history teacher is hopeless. I just sit there and wait for her to write on the whiteboard. After I graduate from primary school, I want to go to junior high school. If I can, I want to go to senior high school. I’ll have to go to Singaraja for that. I don’t want to live in Singaraja. If I lived in Singaraja, I wouldn’t be able to work after school. I want a motorbike so I can go to school and come home each day. If I graduate from high school, I want to get a job as a driver. I want to drive tourists around the island. They can just write down where they want to go on a piece of paper and I’ll take them there. The only problem is that I can’t speak English. But I could learn. I’d soon pick it up if I was working with foreigners all the time. Ketut Kanta teaches the Kolok children at the local school without receiving any salary for his work. Photograph by Poriaman Sitanggang. Copyright 2010 Poriaman Sitanggang / PNPM Peduli. I was born in Bengkala. I’m inget. That means I can hear. When I was young, no one in my immediate family was kolok. Even so, I grew up speaking Kata Kolok. Practically everyone in Bengkala speaks at least some Kata Kolok. Of course, the kolokthemselves speak it better than anyone. Their immediate family, their parents and brothers and sisters usually speak it very well too. But everyone can speak it at least a little bit.My first close contact with the kolok community in the village was through Kolok Getar’s father. Back then, in the late 1950s and early 1960s, there were no wells and no water pipe systems. Kolok Getar’s father went around the village carrying barrels of water on his back, selling a whole barrel for a few old Chinese coins. I was always amazed at how strong he was, how he never seemed tired or be unhappy. I always used to sit down and talk with him when he delivered water. Of course, we spoke in Kata Kolok. Through my chats with the water-seller, I came to know his son, Kolok Getar. I admired him, too, for his prowess in martial arts. In the end, I came to be quite good friends with their extended families, most of whom were kolok. I remember when my father was rebuilding the family house, all the kolok men came and helped do the work. They did it to help, without being paid: my father just gave them rice and coffee. The kolok are like that: if they like you and trust you, they will help you and be loyal. When I grew older, I moved away from the village for many years. After graduating from college, I worked as a building contractor and then in the tourist industry in the south of Bali. I learned to speak Italian and English quite well. In 1992, when I was in my forties, my health started declining. I decided to come back to Bengkala to raise chickens. I renewed my friendships with the members of the kolok community. I often used to employ them in my poultry business. For a while, my business prospered. Then a disease wiped out my entire flock. At about that time, in 1994, I was appointed as the kepala dusun, the position below the village head in the administration. Because I was friends with so many of the kolok community, they often came to me with questions related to bureaucratic procedure. I became something of an advocate for them in the village administration. There has always been some interest in the kolok community by researchers from across Indonesia and even from overseas. Because I could speak a bit of English and because I was involved with the kolok community and could speak Kata Kolok, I was often asked to help foreign researchers. In 1993, James Eiser, a geneticist, came to conduct research to establish the genetic basis for the deafness in the community. In the same year, John Hinnant, an anthropologist and linguist, came on several occasions. Later, in 2003, an Indonesian researcher, Gede Marsaja, suggested that I might like to go to Holland to work with the Max Planck Institute as an informant for research into Kata Kolok. Four months before I went, I was provided with a handy cam to record the kolok while they spoke with each other and while they interacted with the inget in the village. I was in Holland at Max Planck from November 2004 until March 2006. For much of that time, I went through the recordings that I’d made to make a lexicon of the sign codes of Kata Kolok. I worked with members of the Sign Language Group at the Institute. The group included informants from Turkey, Japan, China, India, Korea, Germany, and Holland. Almost all of the informants were deaf: I was one of a small handful who wasn’t. Twice a week, I took part in International Sign Language classes, so that I could communicate with other members of the group. In Holland, I met Connie de Vos, who was a research assistant to a professor at the institute named Ulrike Zezhan. Connie was interested in doing research into the kolok community for her Ph.D. She was planning to come to Bengkala for intensive field visits beginning in 2006, after I returned to Bengkala. I agreed to act as her assistant and facilitator with the kolok community. She came and stayed at my family’s house for long periods over the next few years. It’s funny: her Indonesian is only passable, but she speaks very good Kata Kolok, now. In 2006, with Connie’s encouragement, I set up an informal class at my house for the younger kolok in the village. I wanted at least to teach them to read and write, as well as arithmetic. Connie provided some funds to buy whiteboards, pens, paper, and a few books. I taught the kolok the alphabet in International Sign Language so that I could teach them to read and write. I taught them the correspondence between the sign alphabet and the written alphabet and the arithmetic symbols for addition, subtraction, division and multiplication. To teach them to read, I made a sign code in Kata Kolok, then get them to spell it out using Sign. I never had any contact with the local school, but in 2007 the headmaster of the local primary school did some training on disability issues and inclusive schools. He wanted to write a proposal to have the school classified as an inclusive school, offering classes to the kolok. His idea was to bring in a teacher from the Special School in Bengkala a few times a week to teach the children Indonesian Sign. He held a town hall meeting with members of the kolok community. He can’t speak Kata Kolok himself. He’s not from here. He explained his ideas through the current kepala dusun, who is a local and who can speak Kata Kolok. The kolok told the headmaster that I was already teaching the deaf children how to read and write. That was the first he’d heard of it. The kolok suggested that Connie and I be invited to attend the meeting. We tried to explain the difference between Kata Kolok and Indonesian Sign. The kolok said they wanted to go on using Kata Kolok, so that the young people would speak the same language as their parents. I volunteered to go on teaching the kolok at the school instead of in my house. I was receiving a small stipend from Connie for acting as her assistant, so I said I’d be prepared to do it as a volunteer. The headmaster agreed, although he also wanted to bring in a qualified teacher from the Special School in Singaraja. In the end that never happened: there were no funds to pay the transportation costs for a teacher to come to the village. It costs Rp 18,000 per day to travel back and forth from Singaraja. There are five kolok students in the school now. They are doing quite well. Usually, kolok children attend special classes that I teach to prepare them for their studies. Like before, I teach them how to read and write, using the Sign alphabet, then they attend the general classes. Some of the teachers are better than others when it comes to paying special attention to the kolok students. It’s easier for the kolok to learn arithmetic than other subjects, because the number of symbols in arithmetic are quite limited. One of the kolok students, Subentar, is in the top rank in arithmetic. It’s harder with a subject like history. It’s hard, but it’s not impossible. For example, I tried to explain to them about Diponegoro and the Java Wars. They know the Kata Kolok sign for “boss,” so I explain that Diponegoro was a big boss from Java. I compare Diponegoro to the village head: I say the village head is a little boss and Diponegoro was the big boss. They know the Kata Kolok sign for “tourist,” so I explain that the big boss in Java had a fight with the tourists from Holland who made everyone work in the fields without getting paid a long time ago. They get the basic idea. Still, arithmetic is easier. I do special classes for the kolok students on Saturdays, as part of an extracurricular program at school. That’s when I concentrate on teaching them how to spell Kata Kolok words in Indonesian. Actually, originally these classes were just for the kolok students, but now almost all the students and teachers at the school come too. The kolok students use them to improve their Indonesian. The inget students think it’s fun, but the teachers from outside use the sessions to improve their ability to communicate with the kolok students through Sign and Kata Kolok. I’m glad the other teachers are interested. Perhaps it’s because they are dedicated teachers. It’s also because they see that foreigners and researchers are interested in the kolok community. The kolok are what make Bengkala special: no one in the outside world would be interested in this village if it wasn’t for the kolok. The teachers know that, so they are motivated to learn how to communicate with the kolok too. I’m 52 years old. There’s no way that I’ll be appointed as a civil servant at this age. I don’t receive a salary as a research assistant anymore, but I want to go on teaching at the school even though I don’t get paid for it. I’m supposed to get an allowance of Rp 50,000 per month, but it often doesn’t come through. I’m training one of the young teachers at the school, Putu Ratniarsih, to take over from me when I can’t go on. She’s only 24 and she comes from Bengkala herself, so her Kata Kolok is quite good. She has already been appointed as an official teacher, so she’ll get a real salary. I hope she keeps up the program for the kolok children. If deaf children go to primary school in Singaraja and study Signed Indonesian, they’ll lose their knowledge of Kata Kolok. The inget won’t learn Signed Indonesian. Kata Kolok is what keeps the inget and the kolok together as a single community. Everyone in Bengkala carries the gene for deafness. Our own children could be born deaf. In Bengkala, being deaf is not something that is carried by the kolok alone. It’s something that belongs to the entire community.